Hugh Jackson was hired by the Cleveland Browns today, raising the number of African-American head coaches in the NFL back to five, following the recent firing of Lovie Smith by the Tampa Bay Bucs, who was not retained after two losing seasons. The much-maligned Browns ownership announced Jackson, who is a 29-year coaching O.G. with 15 years of NFL experience, as the team’s 16th head coach. Jackson isnt a new name in the coaching carousel. Hes been there and done that. His name is always on the Fritz Pollard Alliance Ready List, which monitors African-American candidates that are qualified for various coaching and front office positions. He was a highly-touted, hotshot offensive coordinator for the Raiders back in 2010 and by the time he was promoted to the organization’s head coach in 2011, he was recognized as one of the rising offensive minds in the game. The NFL coaching carousel can be unforgiving, unrealistic, unpredictable and nonsensical. Surprisingly, in a league thirsty for innovative game planning, Jackson unfathomably went from leading the Raiders to a promising 8-8 season in 2011 to coaching the Bengals secondary the next. The Shadow League broke that situation down like a James Brown bridge and also elaborated on the state of black NFL coaches in a 2013 piece entitled, Hue Jackson is Not Going To Sit Down and Be Quiet. Jackson…spit that tough, confident football lingo and preached a philosophy of bullying other teams to victory in the mold of Al Davis old school Raiders. Then came the fateful press conference in 12…Jackson basically said the organization was a joke, challenged ownership and vowed to take more control moving forward. Jacksons overzealousness didnt sit well with new owner Mark Davis. About a week later, GM Reggie McKenzie was hired and Jackson was fired. He hasnt sniffed a HC job since. As is the case with a lot of black coaches who get the quick hook in the NFL, theres no explaining why Jacksons job options were as thin as Kerry Washington after leaving Oakland. Especially considering that in his two seasons with the Raiders — the last as HC — he revamped an offense that ranked 31st in the NFL and transformed it into a unit that cracked the top 10 in total yardage in 10 and 11. Around the league, terms like cocky were used as reasons why Jackson was let go and hadnt received another sniff until 2016, when the Browns felt he was the man with the master plan for a dysfunctional 3-13 squad with an offense that ranked 25th in total offense, 22nd in rushing and 21st in passing. The Browns organization is thinking outside of the box and drastically restructuring their front office in trying to correct the failing philosophy of past years. Just a week ago, the Browns stunned the football world by naming Paul DePodesta as the teams Chief Strategy Officer. DePodesta joins the Browns after spending 20 years working in the front office for five Major League Baseball teams. He has worked as an assistant general manager, general manager, executive vice president, and vice president of scouting and player development for the Oakland As, Los Angeles Dodgers, San Diego Padres and New York Mets, his most recent employer. Now Action Jackson will get a chance to mold Johnny Football for success as he has done Andy Red Rifle Dalton. With the Browns seemingly committed to Manziel and his antics and dependencies and insecurities, etc. — for better or worse — Jackson’s no-nonsense coaching approach is welcomed. Jackson will speak his mind and not accept clown behavior or selfish attitudes, especially from his QB. 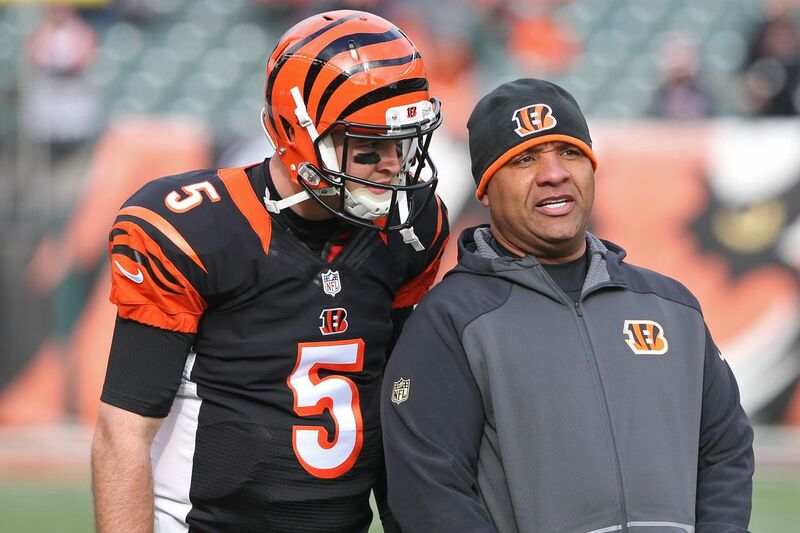 Hue will establish himself quickly as the leader and hold his players accountable for their actions. One thing’s for sure, when he touches an offense it turns into paydirt. Some people wont be high on the hire and will say, If he couldnt cut it in Oakland, why do we want him in Cleveland? Its also a better time now. His coaching style is needed in Cleveland. Plus, the man knows how to put up points as hes made his mark in the league as a standout offensive coordinator for the Washington Redskins, Atlanta Falcons, Raiders and Cincinnati Bengals the past two seasons. The Bengals were a Top 5 team this season in total offense and passing yards. In an NFL climate that still seems fearful of entrusting franchise control and leadership to a minority, Jackson got that second chance that people says brothers in prestigious leadership positions dont get. Its no small task. Cleveland football has been a cesspool of gridiron failure. Hopefully Jacksons ownership group is patient and committed enough to let him build a team and nurture the franchise into a perennial winner.